The Project Manager’s Report: Joe Fletcher revealed that the congruence between projected and actual publications for 2013-14 had been 50%. That is, we published the number of works we projected, but only half of them were the works we had listed in our projections. Happens every time to a greater or lesser degree; it will almost certainly happen again this year. What we call the Essick Catalogue—Bob Essick’s very useful personal catalogue of all things Blakean—is partially encoded. Progress continues. We plan to publish it eventually. We study Joe Fletcher’s list of our unpublished works—in various states of production. There’s the possibility of publishing a group of Blake’s illustrations to Shakespeare—probably in 2016, the 400th anniversary of Shakespeare’s death (see tentative publication schedule for 2014-15 below). Because the illustrations are in various media, and the Archive is organized by medium (illuminated books, color printed drawings, water colors, typographic works, etc. ), the Shakespeare group would be scattered across the main table of contents (cf. the illustrations to Blair’s Grave.) But a possible redesign of the Archive might incorporate a dynamically generated table of contents that could be viewed by medium, theme, date, collection, etc. The discussion moves from possible publications to possible acquisitions, and we highlight the works we want to pursue next, or sooner rather than later, and how we might best go about that. We pick up on this discussion later. Round and round we go. BAND Report (Google video chat with Laura Whitebell, Project Coordinator, University of Rochester): (Explanation: BAND is the Blake Archive Northern Division. It’s a running joke started by the group at Rochester, but it has stuck and spread, so now we also have BATS, Blake Archive Team South; BAWD, Blake Archive Western Division [one-man division Bob Essick]; and BAKD, Mark Crosby’s new moniker for the Blake Archive Kansas Division.) Laura reviews the BAND publications of 2013-14, including the second large installment of Blake’s letters. The letters team is headed by project assistant Nick Wasmoen, who has been working on the next installment this summer. BAND has been active in social media, spurred on by Eric Loy, who has set up a system for regular tweeting and blog posting. Laura reports on some of Eric’s suggestions for increasing traffic to the blog, particularly by harnessing the power of Google Images. Laura raises key questions that have surfaced during our editing of typographical works—which are in many respects simpler than manuscripts but present tricky problems of their own. Morris explains the intersection of BAND with the new Mellon Digital Humanities Graduate Program at Rochester. BAND is one of the “digital humanities labs” that Mellon fellows—Ph.D. students in the humanities—can work in. Team Color Code—the BAND group that focuses on the handling of Blake’s Four Zoas manuscript—will expand in the next couple of semesters to intensify work on that daunting document. Bottom-to-top site redesign is the goal—a major and costly effort but long overdue. Mike Fox (our new technical editor) is in charge. Many small changes have been made during the past year to improve existing features such as Compare, Supplementary Views, and Related Works. A work plan has been developed for the overall redesign. We’ll pursue it as one of our primary goals in 2014-15. 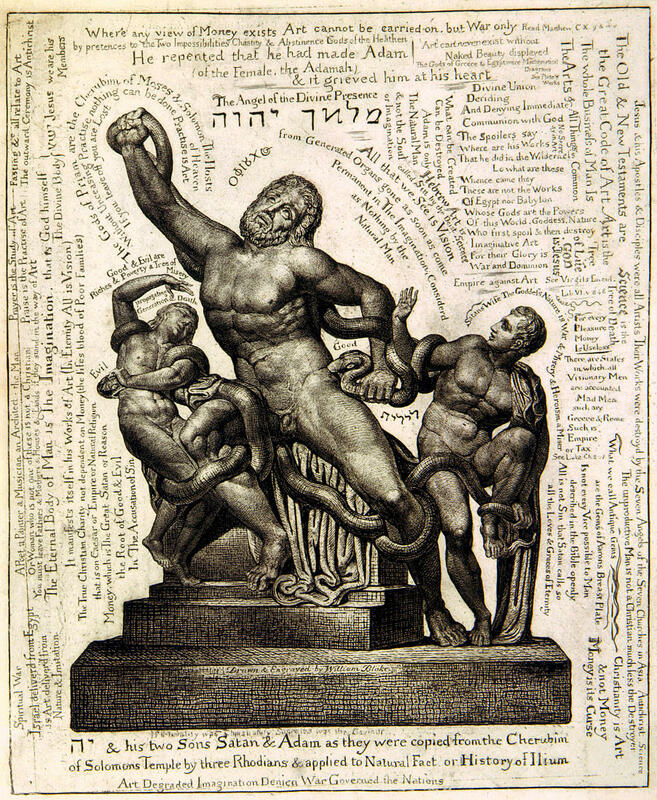 Project assistant Adam McCune joins us to present a demo of Blake/An Illustrated Quarterly. 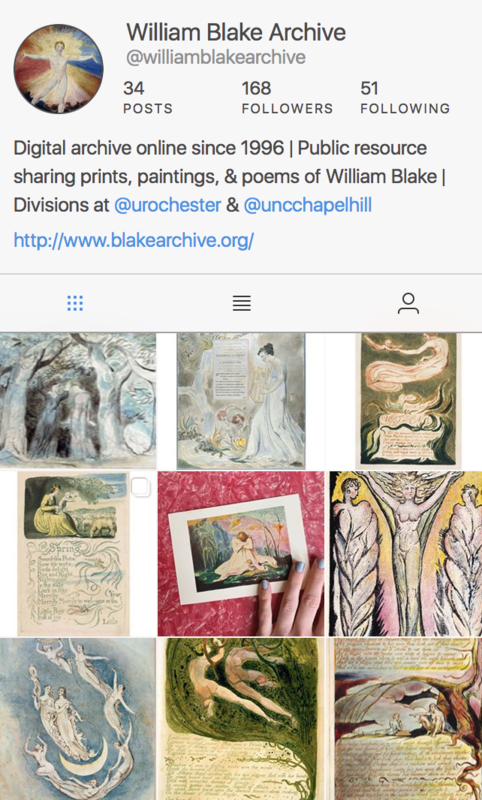 We plan to publish the first installment—several years—of Blake back issues in the Archive this year. The design for those issues offers a workspace for thinking through the redesign of the Archive as a whole, for mastering some useful software, and for establishing a Git repository. One problem to be solved: how to move current issues of Blake, now online via the Open Journals System platform, into the Archive most efficiently. Sarah Jones, managing editor of Blake, will supply some sample electronic files of current issues for examination. We have a long open discussion of the interface for the redesigned site. How do we incorporate all the features already available and add new ones but streamline the look and make the functions more obvious at a glance and immediately accessible? Mike Fox proposes a “gallery” model that treats copies of works more like rooms in an exhibition than like images on pages. We decide to publish Preview versions of The Four Zoas and Notebook manuscripts (both British Library) without transcriptions and illustration descriptions so that users will have access to high-resolution images and basic metadata while we continue to solve the deep problems presented by those exceptionally complex manuscripts. Team Color Code at Rochester—charged with solving those problems—has been experimenting with adaptations of the Text Encoding Initiative’s genetic-editing module. The next steps are to reexamine Justin Van Kleeck’s original basic XML encoding of the text of FZ; consult with other projects dealing with difficult manuscripts; and establish an explicit workflow.